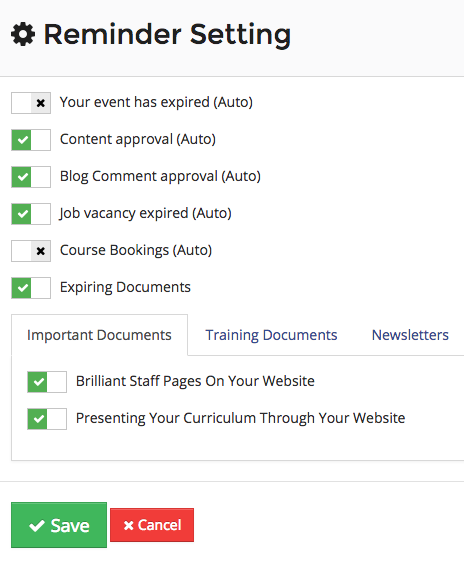 Reminders have been designed to help keep on top of the changing content on your website. From expiring documents, to events or job adverts that have passed. Reminders are displayed next to the username in the top bar. New reminders are shown there and there's an option to view the full list of reminders. Reminders are enabled per user by each user. Click the username to display the dropdown menu, then Reminder Settings. This page contains settings to control which reminders are displayed. When selected sends a reminder when the date of an event passes. Once the event has passed this reminder could be used to prompt the writing of a news article about the event. When selected sends a reminder when content has been added by an editor user that requires approval. When selected sends a reminder when a comment has been added to a blog post that requires approval. When selected sends a reminder when the closing date of a job vacancy advert passes. When selected sends a reminder that a new course booking has been made through the system. When selected provides a list of all document groups and documents to receive reminders when they reach expiry date. Only documents with an expiry date will show in the list. If the document you want a reminder about does not appear check a date has been added for the document in the document group itself. Each document within a document group can be given an expiry date. Each document within the group has an expiry date field that can be filled out when the document is added or updated. Save the document after adding the date to add the expiry date and make this document available to select from the Expiring Documents section in the Reminder Settings.